In 2001, IK Multimedia made history with SampleTank, the first ever sample-based sound workstation for computer. That release was followed in 2003 by SampleTank 2, which has since become an industry standard with an unparalleled software longevity due to its high-quality sounds, easy-to-use interface and powerful included effects. Considering its versatility and power, it's no wonder that SampleTank has been featured on thousands of the most iconic productions and compositions of the last decade. These sounds are far from ordinary: SampleTank 3's library has been carefully assembled and recorded by IK's experienced recording engineers with high-quality instruments played by professional musicians in some of the world's finest studios. Each instrument has been chosen and recorded to produce the rich depth and vivid realism of live playing. With SampleTank 3, you'll swear a musician is in the room with you — more importantly, though, is that SampleTank 3's powerful editing and effects features let you control every aspect of these sounds, which allows for an unparalleled creative sonic experience. Though SampleTank 3 features a massive quantity of quality content — with a variety that far surpasses similar workstations — its real forte is the quality of its sounds, which accurately replicate all the qualities of your favorite instruments. Its pianos, drums, basses, guitars, synthesizers, brass, strings, vocals and other more exotic sounds shine brightly in any mix with little adjustment. And all this is available in an easy-to-use workstation that has a workflow that lets you get right into doing what you do best: making great sounding music. Another thing that makes SampleTank 3 so powerful is that its massive library of sounds, instruments, patterns, loops and grooves can be customized to suit your exact needs. In addition to its 33GB, you can also choose from a growing selection of exciting and inspiring SampleTank 3 instruments collections. With new additions every month, these instruments are custom tailored for the ultimate sound and groove workstation to give you the tools you need to create any style of music from acoustic to electronic and beyond. Though this whole new world of expansion content can be purchased from the IK online store, it can also be easily accessed from within SampleTank 3 itself. This is due to SampleTank 3's integration with the IK Custom Shop. First launched in 2011 for AmpliTube (and later T-RackS), and with an active community of over 1,000,000 registered users, the Custom Shop offers a seamless way to browse, preview, purchase and download new instruments collections, all without having to leave the SampleTank 3 interface. It sports an easy-to-use and visually rich interface and comprehensive audio demos for each instrument that both combine to help you find the exact sound you need, right when you need it. SampleTank has long been considered the undisputed king when it comes to resampling. Its 3 engines go beyond traditional resampling (which you can find in any sampler). 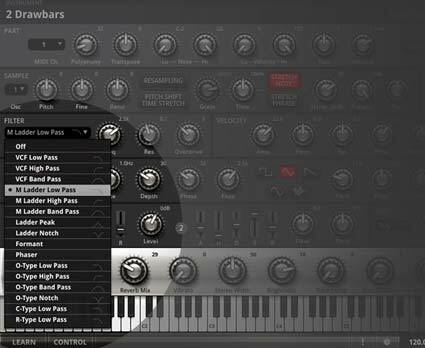 It offers advanced pitch-shifting/time-stretching for loops and grooves. And its unique formant preserving STRETCH™ engine provides an unparalleled level of realism when dealing with vocals, woodwinds, brass and other organic sounds. When used together these features allow for a virtually unlimited assortment of creative sample effect combinations. SampleTank 3 now also includes 16 types of filter effects, many of which are spot-on emulations of some of the most historically significant analog ladder and phaser filters. 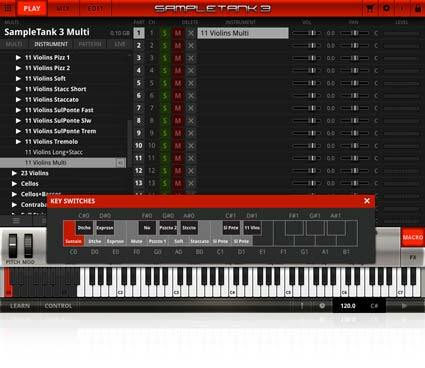 Now you can get your groove on with SampleTank 3’s new built-in MIDI engine. Use hundreds of grooves, patterns and loops to build killer rhythmic tracks that you can easily sync together — you can even export them to your DAW. SampleTank 3's multi-part pattern player can hold up to 128 simultaneous MIDI patterns in each of its 16 parts. This allows for extensive control of intensity, transposition and quantization. SampleTank 3 lets you use the included ore-made patterns and loops to come up with complex and inspiring rhythmic textures and beats on the fly. These grooves are lifelike and highly professional, and that's because SampleTank 3's rhythm section has been recorded by some of the finest drummers and percussionists in the world. Now you can have great sounding, pro-quality grooves right from the start. On top of that, the internal multi-effects selection now contains 57 high-quality effects with 24 brand-new effects derived from the best analog-modeled algorithms and convolution technology found in AmpliTube and T­RackS plus brand new effects developed just for SampleTank 3. For years, SampleTank has been the workstation of choice for live performance on stage with laptop. Now, SampleTank 3 is an even better choice thanks to its new live feature.Now you can organize your set lists and song sounds within SampleTank 3 for instant recall with direct on-screen selection or MIDI Program Changes.SampleTank features an innovative memory management system so you can pre-load sounds into RAM according to your gig set list. SampleTank has always been very easy to use and this is a key point also for SampleTank 3. It features a beautiful, uncluttered look that's sure to please both your ears and your eyes. And now SampleTank 3 is more visually appealing than ever, with each sound library displayed as a graphic banner and each main instrument depicted in 3D for immediate visual reference and instant recognition. This, together with its smart design workflow makes learning and working with SampleTank 3 a breeze — you'll be up and making music in minutes. 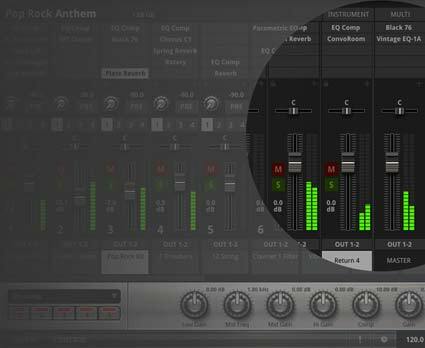 If you want to check out the power and flexibility of SampleTank, you’re in luck. SampleTank Custom Shop is a fully functional FREE version of SampleTank 3 that adds a built-in player feature that lets you purchase, download, play and edit instruments from the entire massive collection of additional SampleTank 3 Instruments, and it comes with 30 fully editable instruments, all in one convenient plug-in and standalone player. SampleTank Custom Shop lets you get creative with a fully functional library of 30 high-quality instruments that have been carefully curated to illustrate the broad sonic versatility available in the full version of SampleTank 3. These 30 editable instruments include a full spread of sounds that put lush strings, delicate woodwinds, buzzing synthesizers, funky basses and more all at the convenient touch of your fingertips. You even get highly regarded sounds like Grand Piano 1 SE, a pitch-perfect representation of one of the most highly regarded German-made concert grands of all time. And you can expand this library from within Custom Shop — you can browse, choose, play and edit from our rapidly expanding catalog of professional instruments collections like Syntronik, Miroslav Philharmonik 2, Hugh Padgham Drums, Alan Parsons Imperial Grand, Future Synths and others. The PLAY page will be immediately familiar to SampleTank users: On the left is the browser where you load Multis (previously known as Combis), Instruments and Patterns. On the right is the Part Viewer where you can see the contents of each Part and adjust its most basic parameters. SampleTank 3 lets you load multiple MIDI patterns in each Part. Now you can build inspiring grooves directly within the software and play them at will. The Live tab lets you bring SampleTank 3 on stage with you easier by giving you a clean way to organize your performances by set lists and Song, letting you have your sounds ready to play instantly with its smart loading management system. The MIX page provides a traditional mixer interface with 5 effects slots for each channel. There are 21 channels in all: 16 channels for each Part, 4 returns for global “send effects” (like reverb and delay) and a master channel. This arrangement lets you get extremely creative — you can have up to 30 effects on a single instrument! 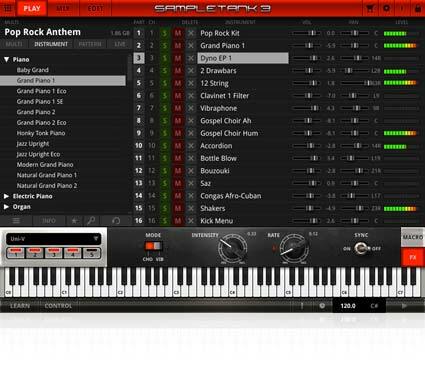 The EDIT page provides full access to SampleTank 3’s powerful synthesizer engine. There you can run your samples through everything from envelopes to LFOs to filters — And speaking of filters, SampleTank 3 features 16 filter types for extreme sonic sculpting. 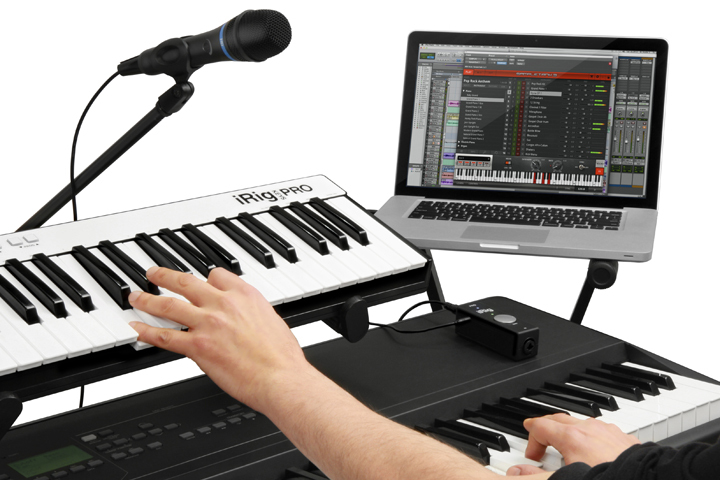 SampleTank 3 now supports direct integration with iRig Pads, IK's ultra-portable MIDI groove controller. Plug in your iRig Pads (or other pad-based MIDI controller) and you can take advantage of SampleTank's Pad interface, which lets you assign SampleTank 3's 16 parts to the 16 pads on your controller for a seamless and tactile "out-of-the-box" music production experience. If you enjoyed the ease of SampleTank 2, you'll love SampleTank 3. It gives you 16 "Parts" that work like a channel on a mixing board or a track on a DAW. Parts are powerful. 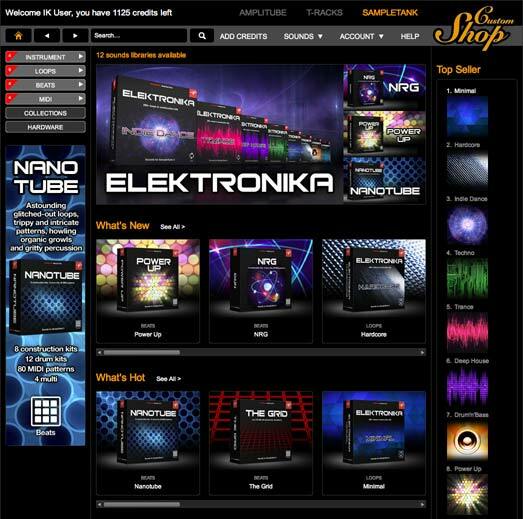 You will use them when selecting instruments, applying effects and using MIDI Patterns. Each Part can contain one instrument and up to 128 MIDI Patterns, and each has its own 5 insert effect slots — now you have a quick way to modify your sounds individually. For more global effects, each part also contains 4 insert effect sends that let you easily send your sounds to effects that process multiple instruments simultaneously like delays and reverbs. Parts are also flexible. Each Part can be assigned to any MIDI channel letting you layer, split and perform complex multi-timbral sequencing with ease. And now, with SampleTank 3's integration with iRig Pads, you can also assign its 16 parts to the pads on your hardware controller. Finding sounds has never been easier. 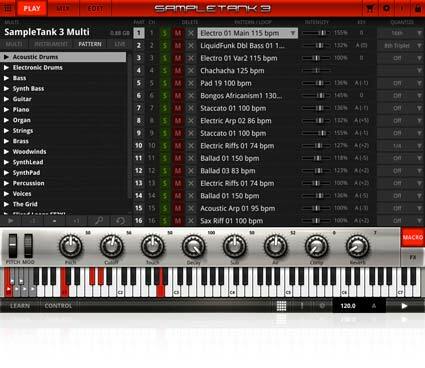 SampleTank 3 features an easy-to-use streamlined browser. Use it to quickly find the sounds you need. Its tabs let you easily navigate between all the essential elements of the Play Page: MULTI, INSTRUMENT, PATTERN and LIVE. Need help? Try the INFO tab at the bottom of the Browser, that's where you'll find all the important details for each sound: its description, a list of its assigned controllers and a vivid 3D representation of the selected instrument. For patterns, switch to the PATTERN tab for a quick way to try out new patterns at various tempos with the sounds you've already loaded. Looking for something? SEARCH lets you use keywords to quickly find the sounds you're looking for using simple terms like music genres or sonic attributes. For example, if you want a pad sound to fill out your electronic track type "atmospheric," and SampleTank 3 will present you with a tailored sound palette of Instruments and Multis. Now you can get back to the more important business of finishing your song. With SampleTank 3, naming, saving and deleting your Multis or Instruments is easy. Just click on the menu icon in the bottom left. On the right is the Part Viewer. It features an overview of the 16 Parts in your selected Multi. For each Part, you can see the loaded Instrument along with easy-access controls for volume and pan. Previous SampleTank users will find this panel very familiar! The Part Viewer is also where you select the Part to load an Instrument into or to access its Macro controls and insert effects in the control panel at the bottom. Want to get in the groove? SampleTank 3 includes an outstanding collection of pre-made MIDI Patterns that you can use to spice up your songs. When you click the PATTERN tab you'll see a list of the MIDI Patterns available — all easily previewable with the Browser's dedicated preview button. You can load up to 128 MIDI patterns per part with each conveniently organized on your keyboard starting from C0 with one pattern per note. A keyboard loaded with patterns is a potent creative tool. Just imagine the possibilities of being able to trigger SampleTank 3's professionally created MIDI sequences as part of a live performance. And with these Patterns you'll always find something that fits. Once assigned to keys you can edit your Patterns to suit the tone of your song by applying quantization, changing the intensity of the Pattern's dynamics or even transposing the Pattern up-or-down. And should you need to take it further you can drag your edited Pattern straight into the DAW of your choice, and it will retain all of your carefully considered fine-tuning. Once your patterns have been loaded where you want them, you can use the Global Play button at the bottom to start and stop all enabled Patterns simultaneously. Different playing styles are what give real instruments their distinct character. SampleTank 3 gives you an unparalleled degree of dynamic expressiveness through its "round robin" feature and multiple articulations, both of which help you mimic the organic tonality of real instruments. Think of articulations as different playing styles. For example, a violinist doesn't just trigger notes but instead uses a variety of techniques — like Pizzicato plucks, abrupt Staccato bursts and sustained Sostenuto tones — to express a full spectrum of musical emotions. 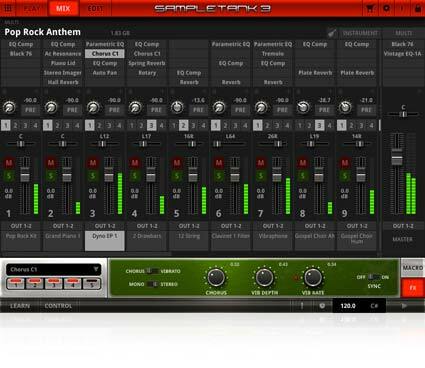 SampleTank 3 lets you apply the same principle to a majority of its sounds. These articulations are easy to use and can be played in a variety of ways: assign them to a specific key, control them with the modulation wheel or simply cue them by playing different velocities. This is particularly noticeable when it comes to acoustic instruments where subtle changes in technique — like finger plucking versus pick playing on a bass — make all the difference. If you have a gig to go to, you've got to check out SampleTank 3's LIVE tab. It's where you can quickly organize your sounds for live performance. After you've picked your instruments you can create an entire Setlist. And with SampleTank 3's smart loading system, you will have all your Instruments, Multis and Effects pre-loaded for you so you can switch sounds instantaneously and segue into your next song without having to wait. 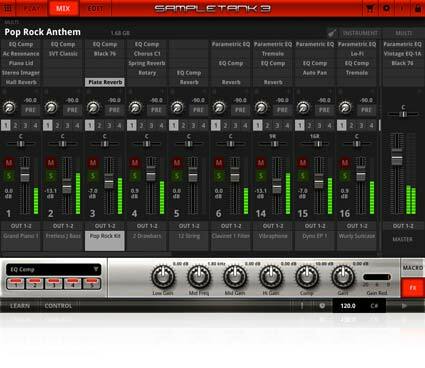 SampleTank 3 handles the details — now you have a sound workstation that you can perform with on stage with confidence. 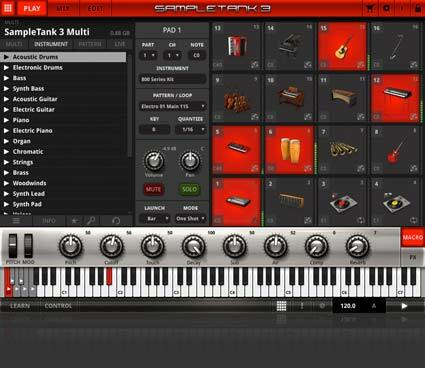 Mix, match and let your creativity run wild: SampleTank 3 makes it easy to use multiple instruments. Want to combine an Acoustic Bass with a Vibraphone? It's a breeze. Just assign whatever Parts you'd like to the same MIDI channel. It's just as simple to split your keyboard to play multiple instruments. Just do the same thing but use the Edit page to choose which keys trigger which instrument. To play multiple parts at once, such as with a sequencer or DAW, assign each Part to its own MIDI channel. Now you can play each Part as though it were its own sound module. With 5 insert effects and 4 effect sends on every Part — plus additional racks of outboard processors — it's like having 16 different sound modules to play with! SampleTank 3 gives you the power, flexibility and versatility to develop complex sounds and arrangements with an interface so effortless that even a non-musician can understand it. SampleTank 3 is fully compatible with iRig Pads, IK's full-featured, ultra-portable MIDI groove controller. Now you can take your beatmaking and electronic music production to the next level; iRig Pads Full Integration lets you enjoy an entirely new and tactile "out-of-the-box" musical experience when using SampleTank 3. The new "Pad" interface lets you plug in and immediately start playing SampleTank from your iRig Pads. It provides full integration, allowing for a new way to control SampleTank's 16 parts without having to click a mouse. Immediately take control with SampleTank 3's new Macro Panel. Now each and every instrument in SampleTank 3's 33 gigabyte sound library comes with a customized instrument-specific Macro Panel that features 8 of the most relevant controls. Now you can quickly fine-tune the sounds you want: adjust the release of your pads, the key percussion of your organ, the volume of the kick in your drum kit and much more. Now you'll spend more time playing and less time editing. As noted, these Macro controls vary from instrument to instrument. For example, on a piano you can control its lid, its harp resonance and the amount of room reverb applied. 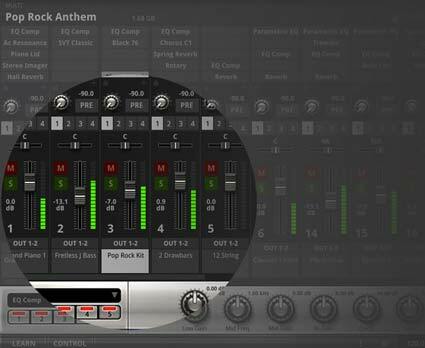 Or, on a drum kit, you can adjust the volume of each individual drum and cymbal as well as the level of compression applied. These Macros are there to make your life easier. Now you'll always have the controls you want, right where you need them. SampleTank 3 is all about keeping your workflow clean and efficient, which is why it now lets you quickly preview the the effects in a Part's 5 effects slot via the "FX" button. Click the FX button at the lower right to change the panel’s display from the Macros to the FX. Select the Part you want in the Part Viewer above, then simply click the effect slot to view, edit or bypass the loaded effects. For maximum ease you can even load new effects right from this panel. The MIX tab is where SampleTank 3 gives you the familiar interface of a DAW mixer with console-style channel strips and insert FX. There are three kinds of Channels: Part Channels that contain SampleTank Instruments, Return Channels that are used for global-style effects (like delay and reverb) that can be used for several Instruments simultaneously and the Master Channel where you can perform all your final mastering processing. Channels 1-16 represent each of the 16 Parts in SampleTank 3. Each Part can contain a single SampleTank Instrument with a channel strip that gives you mixing board style controls for volume, pan, mute and solo. Use the 4 send buttons and use the send knob to adjust the send levels from the channel to the 4 Return Channels where you'd typically put multiple instrument effects as opposed to those used on each channel. You can also use the sends to create “groups” for processing with bus processors like compressors, limiters and equalizers. At the top of each channel strip are the 5 insert effects slots. Click to load any of SampleTank's 3 effects into any slot – there are no limitations other than that of your computer’s CPU power. The effect slots are serial: the first slot feeds the second slot, the second slot feeds the third slot and so on. These effects process only their own channel, just the individual Part and its loaded Instrument. Use an effect slot to view the effect in the FX Panel at the bottom of the window just like on the PLAY page. To the right of the 16 Part Channels are the 4 Return Channels. These channels do not contain Instruments but instead are fed a signal from the 4 effect sends on each of the Part Channels. This lets you send signals from any Part Channel to any Return Channel. Typically, the Return Channels are used for effects fed from multiple instruments like reverbs and delays — for example, you can use just one ConvoRoom reverb for your piano, string pad or synth lead. But you can also use the Return Channels as “groups” to process several Instruments together with bus processors like compressors, limiters and equalizers. The Black 76, White 2A and Model 670 limiters and Tube Program EQ are exceptional for bus processing. This technique is especially powerful with multiple drum channels. For example, put your kick drums on one channel, snare drums on the next channel and toms on another channel. First process them individually with their insert effects and then equalize and compress them as a group for a punchy and aggressive sound that's suitable for any genre. Bus processing helps you “glue” multiple elements together by using common processing on the group which adds clarity and punch to your production. The best mixing engineers have used this technique for years. Now you can use it right inside your Instrument before it even reaches the DAW. It’s like having 4 additional master channel strips! IK Multimedia made a big splash with its T-RackS mastering suite of top analog-modeled effects and precision digital processors. 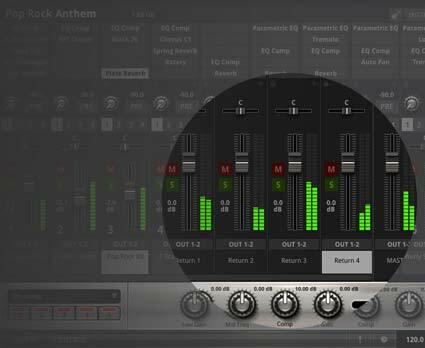 T-RackS provides you with the tools to “master” your final mix with global equalization, compression, limiting and even stereo width adjustments and subtle global reverb effects. 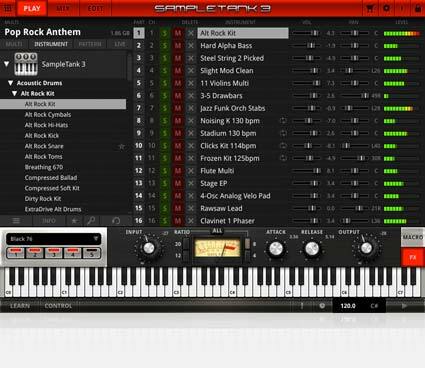 Now you can do the same thing right inside SampleTank 3. The Master Channel has 5 effect slots just like the Part Channels and Return Channels. Once you have dialed in the effects on your individual Part Channels and used the sends to apply reverbs and delays — plus any bus processing of groups of instruments — you can then master your final output with effects on the Master Channel. And we mentioned T-RackS for a reason: 4 of the best analog modeled mastering effects from T-RackS are included in SampleTank 3: the Black 76, White 2A and Model 670 limiters as well as the Tube Program EQ. All of these effects have been meticulously modeled after some of the most famous analog studio outboard gear of all time. This is equipment that's defined the sound of some of the biggest hits in popular music, from classic rock to modern electronic music. You will not find effects of this quality included in any other virtual instrument on the market today. The MIX page makes working with effects easy. It features an FX Panel that displays the controls for the selected effect so you can quickly and easily dial in the exact sound you’re after. We’ve taken the same eye-catching design aesthetic of the instrument icons to the effects themselves: Guitar amp effects actually look like guitar amp panels. Classic studio outboard gear looks exactly like its outboard hardware equivalent and the same goes for all the included stomp boxes. 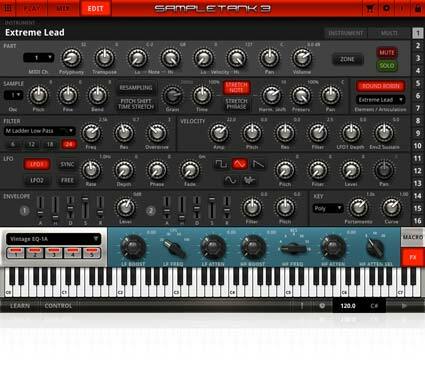 SampleTank 3’s new effects follow the same beautifully designed approach. More than just a set of parameters, SampleTank 3’s effects give you the look and feel of the studio effects that have defined music from the ‘60s to the present. And with the legacy of AmpliTube and T-RackS you can trust that they sound like the real thing. Imagine taking any instrument and being able to process it through a state-of-the-art precision synthesizer. Now you can with SampleTank 3's robust Edit Page which lets you customize and sculpt your sound through a full array of oscillators, filters and envelopes. 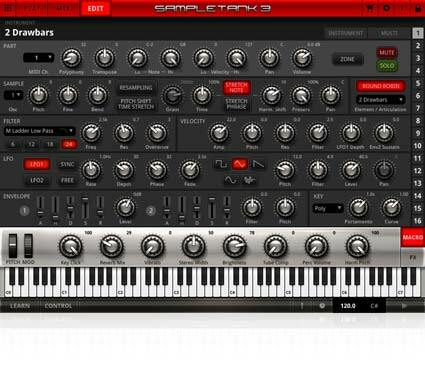 It gives you the power to combine SampleTank 3's high-quality sample library with a powerful synthesizer engine. Now you can take a classic guitar, a priceless violin, a perfectly tuned custom snare drum or even a concert grand piano and then radically reshape and transform it to fit any song. You can do this with any sound in SampleTank 3. Now you have the power you need to carve out the sounds of your deepest sonic dreams and you don't need an engineering degree to do it either. The Edit page gives you 3 playback modes suitable for all kinds of source material, 16 classic and modern filters as well as all the LFOs and envelopes you'd expect. Everything is so clearly labeled and logically laid out that even a beginner can turn the knobs and make interesting sounds. And if you find something you like, SampleTank 3 makes it easy to save what you've got. More engines means more power. 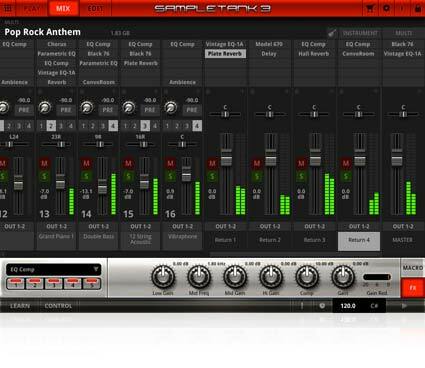 SampleTank 3 features a robust next-generation sampling engine that avoids the problems of more conventional samplers. Have you ever tried to sample a vocal only to hear it played back in the upper registers with that dreaded unnatural "chipmunk" effect? SampleTank gets around this problem with its two new high-powered engines: The first is PS/TS which stands for "Pitch Shift"/"Time Stretch." This engine works to ensure your drum grooves and kits sound good and punchy — just like they were intended to be heard. The second is STRETCH™, which stands for "SampleTank Time REsynthesis TeCHnology." It's there to give you realistic sounding vocals, woodwinds, basses and other organic sounds. STRETCH™ is the engine that gets around that dreaded "chipmunk" effect produced by more traditional samplers. It does this by using an exclusive new resampling technology that shifts all aspects of a sound — sound fundamentals and formant components. This results in extremely realistic sounds even in the upper register. Because of this, SampleTank 3 is able to provide extreme realism on Vocals, Woodwinds, Brass and other organic instruments. Want to import your own sounds? Use the power of STRETCH™ to build your own realistic sounding instruments. With SampleTank 3 all you need is just one sample! 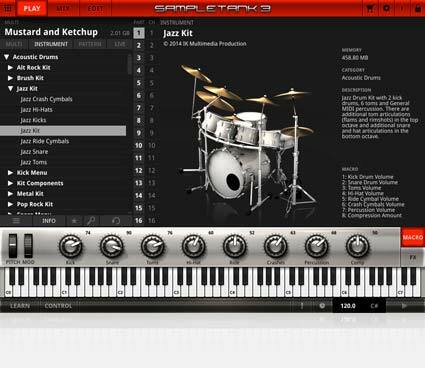 SampleTank 3 includes thousands of ready-to-go loops for Drums, Percussions and groove creation. And thanks to its advanced pitch-shift/time-stretch re-sampling feature, you'll have full tempo control while retaining the best possible sound quality. Change groove tempos and sync loops seamlessly. With SampleTank 3 you'll have a blast and get perfect results. Powerful filters make for a powerful program. SampleTank 3 features 16 filters with all kinds of resonance and overdrive to help color your sound. They're easy to use and feature a flexible controllability that you won't find on even the best analog synthesizers. With SampleTank 3, you can turn a pure piano into a mighty synthesizer lead or turn a mighty electronic synthesizer lead into a soft and fluffy pad! SampleTank 3 gives you all the filters you need to make the sounds you want: there's a famous analog transistor ladder filter, a renowned IC chip filter and iconic state-variable filters as well as formant, phaser and multimode filters. SampleTank 3's included filters let you color your sound any shade you can possibly imagine. SampleTank 3 also gives you unique effects. One example is filter overdrive which lets you process your sound by soft-clipping the input to the filter section just like the best classic analog synthesizers of the past. This is an effect that's still emulated today in pop and aggressive forms of electronic music. With SampleTank 3, you'll have effects like filter overdrive which impart an unmistakable sonic character and leave a lasting impression. Electronic music runs on LFOs. Now with SampleTank 3 you have full control of them. Called "Low Frequency Oscillators," these oscillators produce an inaudible frequency that can be used to control filter, amplitude and pitch — think the characteristic "wobble" bass of Dubstep or the warbling tones of moody film soundscapes. SampleTank 3 lets you create sounds resembling both and a whole lot more — plus the ability to sync your LFOs to your master tempo. Now you can make everything from machine-driven electro to subtly organic atmospheric sounds. The only limit is your own creativity. SampleTank 3 gives you the power and flexibility to sync each LFO independently or lock everything together with a single click using the Sync button. Most synthesizers provide a typical attack, decay, sustain and release envelope section. SampleTank 3 goes far beyond this with an added "Hold" stage that lets you get creative when working with loops. Have you ever wanted to apply an envelope to a loop and have it timed with the start time? SampleTank 3's Hold stage lets you adjust the envelope to account for this. Try programming that with a traditional ADSR envelope — you simply can't! 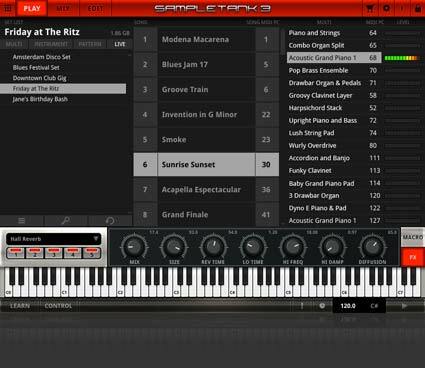 SampleTank 3 is on the cutting-edge of music technology, and it'll take you into a whole new world of sampling. The reason SampleTank has remained an industry standard after all these years is due to its superior sound quality, extensive variety and ease of use. 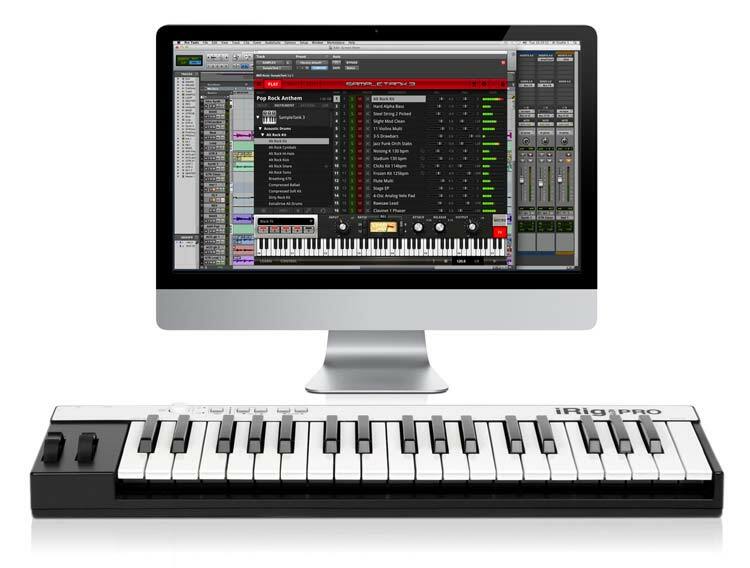 With its easy-to-use interface, all the sounds you need are just a click away. SampleTank 3 pushes this even further by giving you one of the widest selections of quality sounds that stretch across every possible category. Not so with competing products, which often provide just one set of instrument samples — their additional "instruments" are generally just alternate programmings of the same worn-out sounds hidden behind different effects, filters and envelopes. Instead, SampleTank 3 provides multiple sample sets in each category which then have various programming variations under each unique instrument. This puts SampleTank 3's library — with its unparalled depth and variety — on a much higher level than any other similar instrument on the market today.